What an elegant accent for any formal kitchen or bath design! This 1870s Egg and Dart Bin Pull (2 7/8-Inch Center-to-Center) features a center medallion surrounded by a neo-classical egg and dart border. 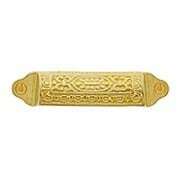 Made of heavy-duty cast brass, it is both durable and easy to grip. Unlacquered allows for natural aging. Our living antique finish accents the stately pattern of this 1870s Egg and Dart Bin Pull in Antique-By-Hand (2 7/8-Inch Center-to-Center). Featuring a center medallion, surrounded by a classical egg and dart border, it is perfect for any formal kitchen or bath. 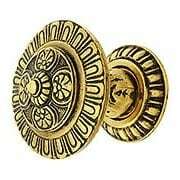 Made of durable cast brass, it comes in our exclusive Antique by-Hand - a finish that ages gracefully over time into a beautiful natural patina. Our living antique finish accents the stately pattern of this 1870s Egg and Dart Bin Pull in Antique-By-Hand (3-Inch Center-to-Center). Featuring a center medallion, surrounded by a classical egg and dart border, it is perfect for any formal kitchen or bath. 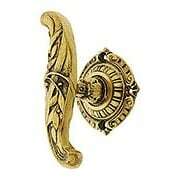 Made of durable cast brass, it comes in our exclusive Antique by-Hand - a finish that ages gracefully over time into a beautiful natural patina. 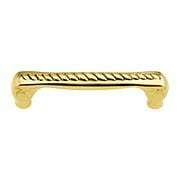 What an elegant accent for any formal kitchen or bath design! This 1870s Egg and Dart Bin Pull (3 1/2-Inch Center-to-Center) features a center medallion surrounded by a neo-classical egg and dart border. 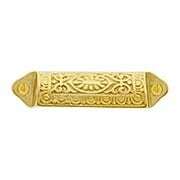 Made of heavy-duty cast brass, it is both durable and easy to grip. Unlacquered allows for natural aging. Our living antique finish accents the stately pattern of this 1870s Egg and Dart Bin Pull in Antique-By-Hand (3 1/2-Inch Center-to-Center). Featuring a center medallion, surrounded by a classical egg and dart border, it is perfect for any formal kitchen or bath. 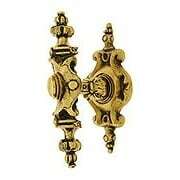 Made of durable cast brass, it comes in our exclusive Antique by-Hand - a finish that ages gracefully over time into a beautiful natural patina. A traditional rope border makes this Small Cabinet Knob (1 1/8-Inch Diameter) a favorite for Colonial-Revival style kitchens. 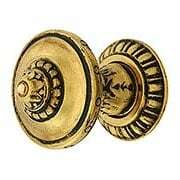 Finely crafted from forged brass, it is as durable as it is attractive. Choose from an array of classic finishes! 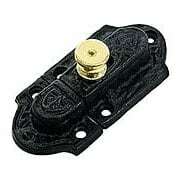 This charming decorative slide catch is operated by simply sliding the petite brass knob. 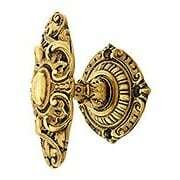 Designed for use on cabinet doors, it adds a unique and authentic period flavor to any room. Made from durable cast iron, finished in a rust-resistant powder coating. 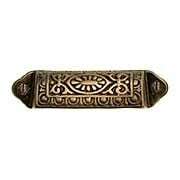 This stately neo-classical drawer pull features an acanthus medallion surrounded by a crisp Greek-key border. 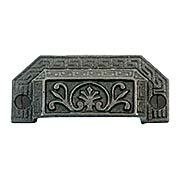 The late nineteenth century design is carefully reproduced in cast iron with a lovely "antique pewter" finish. So refined, yet so durable! This leafy Victorian bin pull has a wonderfully sculptural quality. Reproduced in heavy duty cast iron you'll find it durable, attractive and easy to grip. Antiqued and lacquered to preserve the finish. 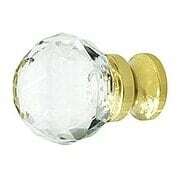 Our stunning prismatic cabinet knob will brighten your home with its extravagant sparkle. 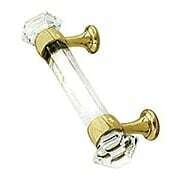 The jewel-like cut crystal is mounted on a shapely brass base, offered in six classic finishes. 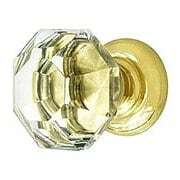 The 1 1/2" diameter size is suited for both cabinets and furniture. 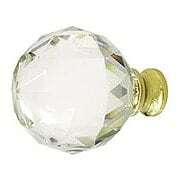 This exquisite cut glass knob adds a distinctive touch to your cabinets or furniture. Multi-faceted and amazingly clear, it sparkles like fine European stemware. 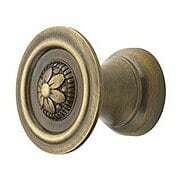 The knob is mounted on a shapely forged brass base, which comes in 5 classic finishes. At 1 1/4" in size, it's suitable for drawers and doors throughout your home. 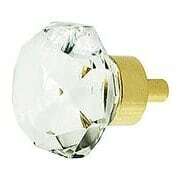 Sparkling cut crystal knob with many facets in a diamond shape. 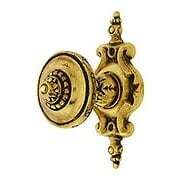 This Victorian style knob will add distinction to any interior space. The 1 5/16" size is suitable for cabinets throughout your home. 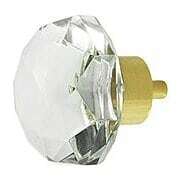 Exquisite cut crystal knob with many facets in a classic octagonal shape. 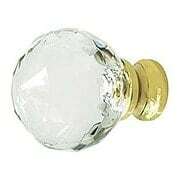 This Victorian style knob will add distinction to any interior space. The 1 1/2" diameter is an ideal size for larger cabinets, built-ins and vintage furniture. 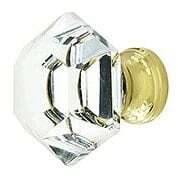 Exquisite cut crystal knob with many facets in a classic octagonal shape. 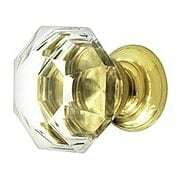 This Victorian style knob will add distinction to any interior space. The 1 3/16" size is suitable for cabinets throughout your home. 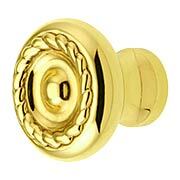 Accent furniture and cabinets throughout your home with this wonderful English-style knob set. Inspired by Corbin's 1905 "Mantura" pattern, our modern recreation is finely cast in zinc for precise detail. Lavished with traditional, neo-classical designs, and your choice of three luxurious finishes, including satin 24k gold, it adds instant elegance to any formal decor. Handcrafted in the USA. Recalling 16th-century English style, the Portobello knob and Kensington back plate add an elegant look to cabinets and furniture alike. Finely cast in pewter, its Renaissance-era leafy motif is displayed in precision detail, and an amber-color gem offers a charming accent. Choose from three luxurious finishes, from antique pewter, to dark brass, to a rich, satin 24k gold. Handcrafted in the USA. 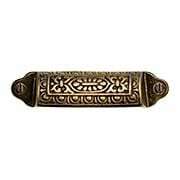 Recalling 16th-century English style, the Pembridge pull and Griffin back plate add an elegant look to cabinets and furniture alike. Finely cast in pewter, this set's Renaissance-era leafy motif, decorative strapping, and stylized griffins are displayed in precision detail. Choose from three luxurious finishes, from antique pewter, to dark brass, to a rich, satin 24k gold. Handcrafted in the USA. 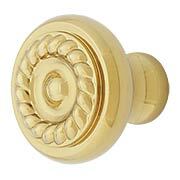 Our Queensway cabinet knob and back plate captures the opulence of early 18th-century English-baroque style. Each piece is beautifully cast, then finished in your choice of three luxurious finishes, from a silvery antique pewter, to rich dark brass, to a radiant satin 24k gold. Leafy foliage and delicate swirls are presented in splendid detail. A must have for high-style period interiors! Handcrafted in the USA. 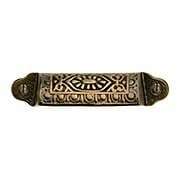 Chelsea Cabinet Pull with Queensway Back Plate - 3" x 3/4"
Our Chelsea Cabinet Pull (3-Inch x 3/4-Inch) adds an abundance of elegance to cabinets and furniture. 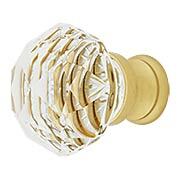 This classical-style cabinet knob features a leafy motif, and our early 18th-century English, baroque-style Queensway back plate. 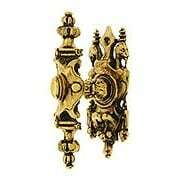 Finely cast for intricate detail, this set comes in three rich, hand-applied finishes. Choose from a silvery antique pewter, rich dark brass, or radiant, satin 24k gold. Depending on your application, it can be installed either horizontally or vertically. Handcrafted in the USA. Recalling 16th-century English style, the Pembridge Knob with Matching Back Plate adds an elegant look to cabinets and furniture alike. 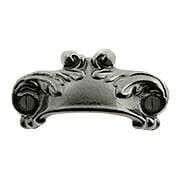 Finely cast in pewter, its Renaissance-era leafy motif and decorative strapping are displayed in precision detail. Choose from three luxurious finish options. Handcrafted in the USA. Recalling 16th-century English style, the Portobello knob and Pembridge back plate add an elegant look to cabinets and furniture alike. Finely cast in pewter, its Renaissance-era leafy motif is displayed in precision detail, and an amber-color gem offers a charming accent. Choose from three luxurious finishes, from antique pewter, to dark brass, to a rich, satin 24k gold. Handcrafted in the USA.